Now I publish the Japanese translation of Amiga Music Programs by Johan Kotlinski, aka Role Model and Mathman. This essay was firstly written in Swedish for a college course in 2003. In 2009 he translated it into English by himself and published it with a host as CHIPFLIP, a website by Anders Carlsson, aka goto80. 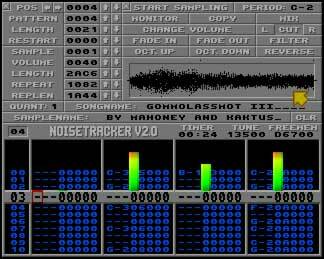 Amiga Music Programs is a document, which united the complicated history of so called “trackers,” software for making music we could find out around us. Amiga, a home computer appeared in the late ’80s, is the starting point of this document. For us living in Japan, most well-known composing tools originated in “trackers” at present are probably Renoise and LSDj produced by Joahn. How the ancestor of these modern trackers appear? Johan’s essay can tell us the interesting history of trackers. We can also know trackers have developed working together with “the scene,” an underground movement using home computers through this compact and sharp historical study. In Japan there are some traces of osmosis about the home computer culture of Commodore 64 and Amiga, and the scene, but are not as many as Europe. However we have not always been indifferent with them. On the contrary Japanese “MML” users can question what is not written in this essay. Some of comparative investigations are thought experiments we should begin with. Although this essay was written 10 years ago, it is still full of possibilities. I would like to note research and reflection about trackers are in progress all around the world. For example Johan placed Amiga music programs to categories between synthetical (synthetic) and sample-based. Even if the categorization was outstanding at the moment of 2009, this distinction and conceptualization were not necessarily definitive. In 2012 Anders responded to the challenge Johan tried out and wrote the article. He propose new three categories of trackers, or Soundtrackers, Hypertrackers and Acidtrackers. Once when I listened to SID music, I became aware the demo musicians from late ’80s to ’90s were very young. I was very amazed at the fact. Are there some particular secrets around time/age of the scene and chipmusic? As Johan pointed out, the scene took form with a focus on teenagers. I knew the fact, then immediately I remembered Japanese teenagers also have composed music with PC although methods were different. Of course we, Japanese people, made our own music. But we might prefer made “covers” (of game music and anime theme songs) rather than ripping, appropriating, and including tunes from commercial video games to productions like the scene. (There were some ripping tool as freeware in Japan.) Can we call our activities another “scene” ? Exploring the question is an entrusted tusk to us. I have wanted Japanese people interested in chipmusic or demoscene to read Johan’s penetrating essay since I knew it at Anders’ site. Thank Johan and Anders for realizing my hope. Among translating the essay, I have been motivated by the conversations with these people below. Many thanks! With their strong thought and musical challenges as well as the fruits by Johan and Anders, I would like to mention more the Japanese history of trackers in another place in another way. Thanks to … KUNIO, Kabakism, hide.h, KAZ a.k.a.HIGE, hally, hizmi and Setsuko Hyodo.